Simon & Schuster, 9781476766812, 272pp. 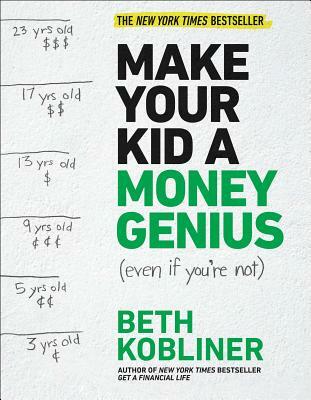 From Beth Kobliner, the author of the bestselling personal finance bible Get a Financial Life--a new, must-have guide showing parents how to teach their children (from toddlers to young adults) to manage money in a smart way. Many of us think we can have the "money talk" when our kids are old enough to get it...which won't be for years, right? But get this: Research shows that even preschoolers can understand basic money concepts, and a study from Cambridge University confirmed that basic money habits are formed by the age of seven. Oh, and research shows the number one influence on kids' financial behaviors is mom and dad. Clearly, we can't afford to wait. You don't need to be a money genius to make your kid a money genius. Regardless of your comfort level with finance--or your family's income--this charming and fun book is an essential guide for passing along enduring financial principles, making your kids wise beyond their years--and peers--when it comes to money.